Daym, is what I was thinking when I saw the above chart, the growth rate of twitter is unheard of in the world of web. 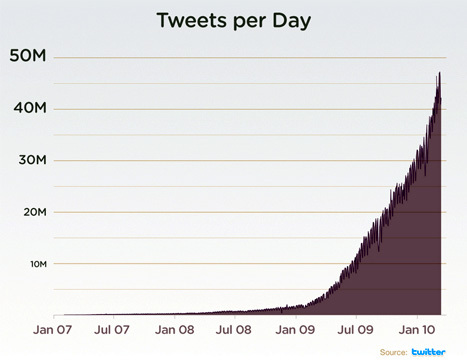 Twitter is now processing 50 million Tweets a day , which comes to about 1.5 billion Tweets a month. By Comparison, Facebook which has more users and the number two website in the world grew so much slower. I went back to read an article I wrote about a year ago. I was such a pessimist, how many friendships and relationships were broken up by it, but in reality how has it helped all of us keep in touch with friends, family and help up network a bit more, both professionally and personally. I am going to look at twitter more positively because it suits me, or at-least my view of how everyone should be. Opinions, in 40 letters or less. This way it helps us Africans who are so frightened of expressing our feelings publicly. Twitter will be therapy for African. I know it sounds ridiculous but think about it, practice makes perfect! Bernos though is not doing so well on Twitter, compared to Facebook, we have 250 followers to 5000 Fans. I was discussing with Beshou, who is much less adverse to the social media technologies, and I asked her how to improve and she gave me some marketing methodologies. Well, and the method although might work were not organic, meaning people that are not inclined to follow us because they want to know about us does not necessarily help us. Its like mass email that is unsolicited. Those that do not opt in to receive it just ignore it, so its pointless. And so when you market, leads are not generated by quantity rather by the quality. ie extreme niche targeting! Published by Nolawi February 22nd, 2010	in African, Bernos and Social. i’m happy i made u a believer! Oh yah the power of twitting!!! The other day I twitted something about PEPCO and after three days someone from PEPCO (@PepcoConnect) responded. I still have no idea how they got it. So anyways follow me @Blencorp. here’s an articly by NYtimes on popularity of twitter verses other social networking media. These two quotes below reflect my views on twitter. I have an account but i wasn’t sold on the idea of letting the world know what am doing, eating, watching or whatever else i do to pple i do or don’t know. i feel like i’m missing out on life while twitting about it. hence twitter is irrelevant for me. however, i see it works wonders for small businesses and artists and others. Craaaap!!! 50 Million time wasting tweets per day! mind you, if you follow a couple of popular once, you will end up getting a tweet every second and you have to be sitting idle reading and responding to all of them. My 2010 resolution was to minimize that and i already deleted my FB account. I forgot about closing tweeter, now i’ll do that. Thanks!! As long as you dont blacklist bernos… we are happy! I don’t want to miss some of the outstanding posts here.. However, I also like to say, it is better to focus to few who really appreciate and understand what you are trying to do rather than to advertise to millions who will never get it. Yilik Tweethin tewina Ato Nolawi, I need one xs made in Merkato, roots and bikila’s t-shirt please. It has been sold out for how long?? Mr. tweet guy?? It seems like you tweet a lot and that means you have a lot of time in your hands so can you please order those t-shirts for me?? thank you. consider the new tees… those are sold out and retired. lol..who said africans have problems expressing themselves…? It is so hard to keep up with these social network sites. I recently came a cross a social network site for Ethiopians called http://www.bunaa.com . Wow. I was astonished with the standard. I hope they become successful as Twitter and facebook. ‘I’m fenna drop a load, but some foo been there for a minute now’ tweet. ‘I’m sitting next to flight marshal..’tweet. fan club for the ‘situation’. Everytime the ‘situation’ utter a word ‘situation’, fan members take a shot. A lady blow her husband’s cover on a facebook. Apparently he was British spy. A lady lost her unemployment paycheck because the picture she posted on facebook. Apparently she supposed to be in depression not having fun on some beach and drinking pina colada. What happened to the good old emailing culture ? However, both tweeting and facebook are just control mechanism for the mass. At least, I believe so. Is it true that http://www.bunaa.com is set up by Kassy Kebede, husband of Liya Kebede? Does anyone have any info? Eyob I went through bunaa.com the site it is cool, I like the name o the site. I have registered, i it is owned Liya Kebede we should support it. Eyob I went through bunaa.com and I agree it very pleasant site, I like the name bunaa. I have registered. If it is owned by Liya Kebede we should support it. can you sent here . .thank youso much you .because .u are incerege me .to regester .to wilfer of .miss aida cebede . but .i doent know how to get this oportuinity. BTW keep up the good site. ahhh have we not passed that time where we install an open source code to create a social networking site? i have seen about enough, and most existed for about two to three months! So what is the point? I checked bunaa…hmmmmm very low in content, and not appealing visualy. And I seriously doubt if Kassa Kebede owns it. I am sure he is got other better things to do. I think i will keep my Facebook. Do you know of a place to get a really nice twitter layout? I intended to send you that tiny observation just to thank you so much over again with your awesome information you have provided in this article. This has been quite remarkably open-handed with people like you to present without restraint all some people might have made available as an e book to earn some profit for themselves, specifically considering that you might have done it in case you wanted. Those things likewise worked to provide a great way to recognize that other people online have the identical passion really like my own to grasp more with reference to this condition. I’m certain there are a lot more pleasurable opportunities up front for those who read your blog post. soundcloud followers Appreciate the particular excellent writeup. The idea in reality had been your discretion bank account it. Look complex for you to significantly provided flexible of your stuff! Nevertheless, precisely how may possibly we keep up to date some sort of communications?